Akram, an illiterate Iranian woman, shows us that true talent will always refuse to be stifled, and that you don’t need an education to understand, to feel, and to paint. She discovered her talent quite by chance at the age of 50, when she was helping her grandson with his homework. The magic of painting holds an irresistible appeal for this uneducated woman who was married off at the age of nine to the then 28-year-old Heydar, and has had to stand on our own two feet ever since. When her authoritarian spouse is out, Akram paints as if her life depends on it. She then hides the primitive, colorful, and expressive paintings under the carpet. But then her “hobby” is discovered and an exhibition of her work is organized in Paris. The rules dictate that she must ask her husband’s permission to go to the opening, but she puts this off for as long as she can. The camera remains in Akram’s home as she paints and squabbles with the cynical Heydar, who thinks she is wasting too much paint. This, then, is a portrait of a painter who expresses herself as colorfully in words as she does in imagery, but it is also a tragicomic portrait of a traditional Iranian marriage. Rokhsareh Ghaemmaghami was born in Tehran. She has a BA in cinema and a MA in animation. She has done some researches on “animated documentary” and Cyanosis is her work for her MA degree. Her research has been published as a book in Iran. Behjat Sadr is one of Iran’s great hidden treasures. With a career spanning more than fifty years, she is one of only a handful of women artists to have received international accolades for their work. Her powerful, unusually constructed abstract paintings have been selected for the Venice Biennial and for gallery and museum exhibitions in Brazil, Canada, France, Iran, Italy, and the U.S. 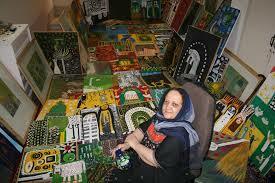 Most recently she was the subject of a major retrospective at the Tehran Museum of Contemporary Art. Sadr’s work continues to evolve over time; indeed one of the distinguishing characteristics of her oeuvre is the artist’s continual search for new and innovative techniques. Rhythm is very important to her work and she is known for her innovative techniques. She has covered the surface of a canvas with black paint and then selectively scraped it away to develop shapes and textures. She has mixed oil painting with photographs, figures with abstractions, working in a variety of media from canvas and oil to wood, metal, and other materials. 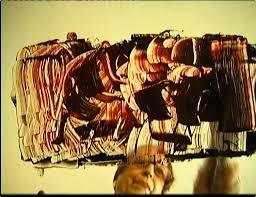 The final product often blurs the distinctions between painting and sculpture. Born in Tehran in Iran in 1975, she graduated in graphic design from Azad university in Tehran in 1997 and then emigrated to Paris and studied at ENSAD from 2000. Her first documentary short film JUSTE UNE FEMME won the Teddy Award at the 2002 Berlinale. TABOUS – ZOHRE & MANOUCHEHR (2004) and FIFI HOWLS FROM HAPPINESS (2013), two feature documentaries, were each premiered in the Panorama section of the Berlin International Film Festival.